Update: Page-Level Ads no longer exist. 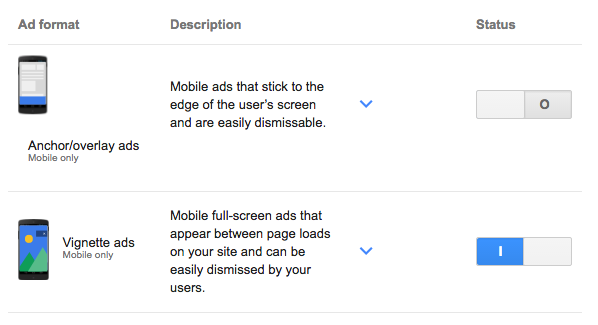 The new AdSense Auto Ads feature replaced them. Read How to set up AdSense Auto Ads in WordPress to learn more. In April 2016, AdSense enabled the new Page-level ads for all its users. If you were wondering how to monetize mobile traffic more efficiently, this might be the answer. Advanced Ads has a feature embedded that allows you to implement Page-level ads into your site with just one click. While you find the tutorial below, you can check out my review on Page-level ads in order to learn if this is worth a try or not. Before using Page-level ads on your site, you need to go to your AdSense account and activate them. You’ll find them under My Ads > Content > Page-level ads. Page-level ads come in two formats. As Anchor/overlay ads which are very similar to our Sticky ads, but only sticky at the bottom of the page on mobile devices. Vignette ads are rather a full overlay, much like our PopUp Ads. Both formats are only working on high end mobile devices and not showing up on every page impression. They also don’t count for the 3-ads-per-page limit. Once you activated at least one of the ad formats, you should switch to your WordPress dashboard and navigate to Advanced Ads > Settings > AdSense. If you didn’t include your AdSense ID, now is a good time to do that. You can find details about it here. Now, you only need to activate the Activate Page-Level ads option and save the settings and the ad tag will be implemented on your site. Since ads only show up occasionally on mobile, you can go back to the Page-level ad page in your AdSense account, scroll down and use the Test it out button to test if the Page-level tag is implemented. If not, please review the settings again or update your cache.